To graduate students who love learning, take pride in community, and pursue their full potential. L. B. Williamson Vision Statement To prepare students to graduate and enter the workforce or college, as literate, reponsible, and productive citizens. Williamson High School began in 1916 as a small neighborhood school, the first in Maysville. The school was housed in the Sons and Daughters of Honor Hall located on Weinacker Avenue near Virginia Street. George Hall, the first teacher, led the school until his death, then Louella Banks became principal. Lillie B. Williamson and a faculty of six teachers succeeded her. After Miss Williamson’s death, the school was renamed in her honor. Eliza Thompson was principal for the next 27 years until she retired in 1948. Lemuel K. Keeby then became principal of Williamson, which only served grades one through seven. Over the next few years, a high school was added to accommodate growth in the Maysville community. The high school saw its first graduating class in 1958. In 1968 the building was expanded to its present capacity. Under Mr. Keeby’s leadership, enrollment rose to more than 1200 students with 67 faculty members. Mr. Keeby served as principal of Williamson for 30 years until his death in 1978. The next principal, Fred N. Green Jr., led Williamson into a new era. The addition of technology, the Academy of Public Service (one of only six in the nation), Project Pass, and a voluntary uniform policy were a few of the innovative programs Mr. Green introduced. He retired in July 1996 after 18 years as principal. In July 1996, Robert Likely became principal. That fall, Williamson was re-evaluated by the Southern Association of Colleges and Schools (SACS) and met all requirements for accreditation. In the fall of 1996, Williamson faced a new challenge-preparing students to pass the Alabama Graduation Exit Exam mandated by the state legislature. That year, Mobile County Public Schools also abandoned the traditional 50-minute class periods for the 98-minute block schedule. Mr. Kim D. Staley was principal for the 1999-2000 school year, also the first year of the Comprehensive School Reform Demonstration Grant based on the High Schools That Work model. In July 2000, Mr. Terrence S. Mixon, Sr., was named principal of Williamson High School. That fall, Mr. Mixon oversaw a massive re-staffing; instituted several new incentive programs designed to encourage and reward student achievement; and took a leadership role in promoting a tax referendum to relieve Mobile’s funding crisis. 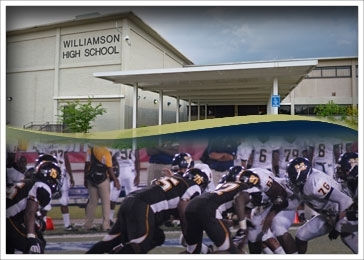 Also under Mr. Mixon’s leadership, Williamson will begin a $5 million remodeling project in the fall of 2001. The main objective of the school SAE plan is to augment all areas of proficiency for all students. The plan identifies the areas of weakness, and states specific ways to improve each area. The plan also states the way each area of the student population can be improved; general education, ESL, special education, and at risk students. This way all students can benefit from the plan. Our school objective is to provide the most assistance possible to ensure each student receives a quality education. Lengo kuu la handlingsplanen Shule ya Ubora mwanafunzi ni kuongeza kukubwa. Mpango unabainisha maeneo ya udhaifu na anwani njia ya kusaidia kufanya maboresho. Mpango hutoa njia ya kuwasaidia wanafunzi katika wakazi wote, pamoja na elimu ya jumla, elimu maalum, ESL, na Asili utendaji. Bila shaka, wanafunzi wote kufaidika na mikakati katika mpango. Ni lengo la shule kutoa msaada inawezekana wote kutoa hisia, ubora wa elimu kwa wanafunzi wote.